This post was syndicated from the Inner Drive blog. 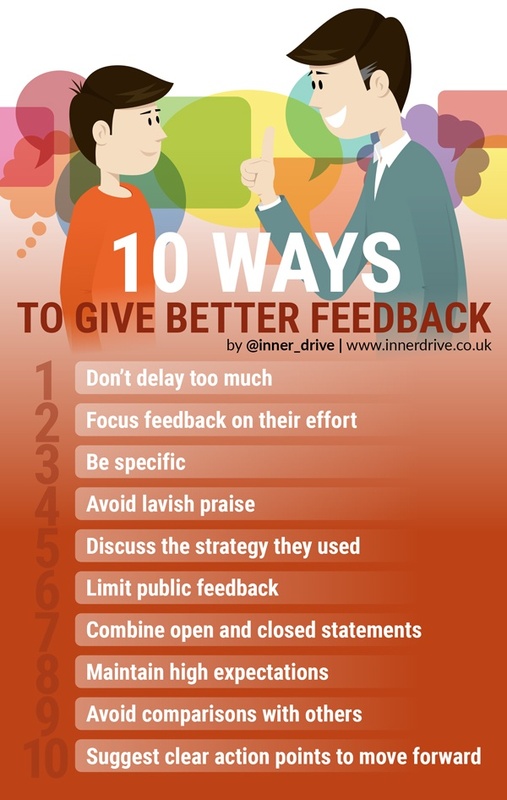 Giving feedback can be a double-edged sword. The Sutton Trustreports that if it is done right, it can be one of the most effective ways to help someone improve their learning; however, research suggeststhat 38% of feedback interventions actually do more harm than good. As coaches, we get paid for the results and the value we bring to our teams and programs we work for, not for the time we put in. I don’t believe our Athletic Directors really care how many hours we work as long as we are winning, graduating our players, creating a good experience, and don’t break rules doing so. Your coaching and recruiting performance throughout each day and week, and ultimately being able to accomplish your big goals for the year personally, with recruiting, and with your team, will be predicated on how you better manage yourself, your time, your decisions, and energy during the day. That is where habits will come in. A Duke University study says that at least 45 percent of our waking behavior is habitual. Although we’d like to think we’re in charge, it turns out that we’re not so much controlling how we act with our conscious mind as we are being driven by our subconscious or unconscious mind. It’s amazing; also, it’s a little disturbing. Habits are all about taking small, smart choices consistently over time to create a radical difference in your life. To build an effective new habit, you need three essential components: a trigger, a micro-habit, and a reward. A trigger – A behavior trigger is something that cues you to do something, it’s the first falling domino that sets you into motion. The routine – the actual thing, or sequence of steps, you do when you get triggered. The reward – the pleasurable thing you get at the end of your habit. Without the reward, your ritual cannot last because it becomes just another “to do” on your already busy schedule. I just created a new Busy Coach 30 Day Habit Challenge for coaches. I chose drinking water when you first wake up in the morning as the first habit to develop. Why water you may ask? It is pretty simple. It immediately helps rehydrate the body. It can improve your metabolism. It helps fuel your brain. It helps to increase your level of alertness. It can help alleviate heartburn and Indigestion. It can prevent kidney stones. It can stop a headache in its tracks. It can keep you from getting sick by helping to flush toxins from your body. In my productivity challenge, I teach you 8 habits. Today I am going to share with you how I get you to establish drinking water first thing in the morning as a habit. Trigger #1: Wake up first thing in the morning. Habit: Drink a 16oz. glass of water. Drinking water is one of the very first things you should do as soon as you wake up. Our bodies need proper hydration to perform at our absolute best. Water is a fundamental aspect of high performance. Dehydration is the number one performance killer for athletes. 80% of headaches are due to being dehydrated. More times than not, when you are feeling sluggish or tired, you are dehydrated. You want to start hydrating as soon as possible when you wake up. I really suggest within the first 10 minutes or so start drinking water, about half a liter or so, which is about 16 fluid ounces. It really signals to your body and to your organs to wake up, to get going and to get ready to really perform at a high level. Have a glass sitting on your night stand or have it waiting for you in the kitchen. Drink water first thing and watch what happens to your energy. You can increase your production and effectiveness as a coach just by using the trigger of getting out of your bed and getting into the habit of drinking a glass of water in the morning. It is so simple and such a small thing but it is extremely effective. If you are interested in checking out my challenge, click here. If you want other productivity resources, go to www.busy.coach.